In this page, we have updated the latest Diploma Govt Jobs 2019. Diploma holders in various streams can check the current Diploma Govt Job Vacancies 2019. At present, many of the Government organizations are very busy in finding the Diploma candidates. There is a lot of govt job openings for both freshers as well as experienced contenders those who had completed their Diploma. In the below section, aspirants can check the latest Recruitments. The Recruitments are only for the people who had done their Diploma/ Polytechnic in recognized university or institute. Scroll down and check out the trending openings for Diploma people. Diploma Govt Jobs 2019: In this page, we have given the most precise information for the sake of candidates such as Diploma Govt Job Vacancies 2019, Govt Jobs 2019 for Diploma holders in Mechanical Engineering, Diploma Jobs 2019 in Bsnl, Govt Jobs for Diploma in Electronics and Communication 2019, Govt Jobs for Diploma Mechanical in Railway Jobs 2019, Govt Jobs for Diploma holders in Electronics and Communication, Diploma Electrical Jobs, Diploma Electronics Jobs, Diploma Mechanical Jobs, Diploma Bank Jobs and much more. A huge number of government companies are eagerly waiting for the aspirants those who had completed their Diploma. Because at present there is a huge demand for Diploma Jobs 2019 in the Government sector. In the above section, we have given the Diploma Govt Jobs 2019 in a table format. By going through the table, aspirants can find the latest Diploma Jobs 2019 in a government sector. By clicking on the above links contenders can find the latest openings. So you can check all the details and come to an idea about the jobs. 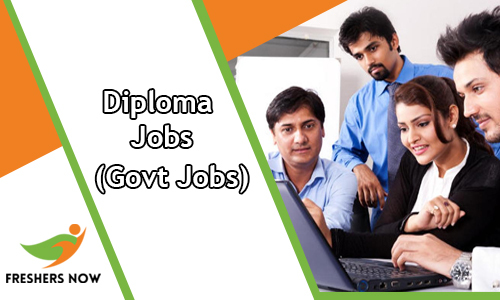 To get more details regarding Diploma Government Jobs 2019 you have to take a look at the complete article. So that people can easily find the latest openings available in the various departments. We all know that there is a specific age limit for each and every post. The Minimum Age Limit for Diploma Govt Jobs 2019 Openings is 18 years and maximum age depends upon the specific Organisation. As the Competition for Diploma Govt Jobs 2019 is very high. We suggest to the job fighters to keep in touch with this page and check the current Openings. With the help of this method, contenders can easily avoid the disappointment. We also advise the aspirants only to apply if they are eligible for the particular post. Otherwise, check the other Govt Jobs for Diploma Holders 2019 which we have given in this article. Therefore check the Diploma Jobs 2019 from the above table. And apply for the suitable post as you like and start your preparation. The competition for Diploma Govt Jobs 2019 is going to be sky high. Without referring the material no one cant give their perfect performance in the written test. BEL, BSNL, BHEL, IOCL, Vizag Steel, BPCL, NALCO, SAIL, CIL, ONGC, NTPC, EIL, Mazagon Dock, NMDC, NTPC, RITES and many more companies are ready to hire the capable Diploma Govt Jobs 2019 in BSNL into their organizations. After applying for the latest openings all the applied aspirants need to face the recruitment rounds that are conducted by the specific organizations. So all the contenders need to clear them to get a placed in the companies. The selected aspirants can get an attractive salary package. Contenders keep in mind that you have to face a tight competition. Many of the Diploma pass students are eagerly waiting for the great job opportunity into a government sector. New year new beginnings, this year a bulky number of Diploma Job Vacancies 2019 are available. At present, the reputed organizations are ready to release the vacancies such as Constable, Head Constable, Apprentice, Retired Staff, AE, Jr Clerk, PGT, TGT, Civilian, Aircraft Technician, Skilled Tradesmen, Jr.Engineer, Jr.Supervisor, Apprentice, Assistant Lineman, Lab Technician, Teacher, General Duty Medical Officer, Senior Resident Doctor, Graduate Apprentice, Technician Apprentice, Group B, Group C, Technical Staff, Trade Apprentice, Testing Attendant, Engineer, Manager, Sr. Manager. Nowadays many of the students are choosing their career in Diploma. Because there are large openings in government sector for the Diploma Jobs 2019. Those who had completed their diploma in Mechanical Engineering, Electronics and Communications, Electrical have major openings in the government sector. Many of the openings are anxiously waiting for the candidates who had completed their Polytechnic or Diploma. We are here to share the complete details about Diploma Govt Jobs 2019. Refer this complete page and get an idea about the latest Diploma Job Openings 2019 for freshers and experienced candidates in government field. This is the correct platform for the people those who had completed their Diploma and want to make their career in the Government Sector. In this page, we have shared most valuable details related to Diploma Govt Jobs 2019. We all know that there is a great openings for the Diploma Pass candidates. Job seekers need to click on the apply link and find out the eligibility criteria details. If you are eligible to apply for Diploma Govt Jobs 2019 then without delay, login to the official website and search for the suitable post. Or you can also check the official notification and download it at free of cost. After that enter your mandatory details and pay an application fee. Once verify your entered details and click on the apply online link. At finally take a print out for the further use. Follow the above given details regarding Diploma Govt Jobs 2019 and shine your career into the Government Jobs. We are sure that we have given all the mandatory information on a single page. From www.freshersnow.com aspirants can get the huge number of latest Diploma Govt Jobs 2019 for both freshers and experienced candidates. Also, get the upcoming Diploma Government Jobs 2019 from here. We update this post every day by providing the latest Diploma Jobs 2019. Visit our website regularly and keep update your self with the latest Diploma Govt Job Openings 2019. If you want to get the instant updates then keep an eye on our site.